Rivers State Governor, Nyesom Ezenwo Wike has approved the inclusion of widows and widowers of fallen heroes in the N2billion CBN fund for women and youth empowerment of the state government . 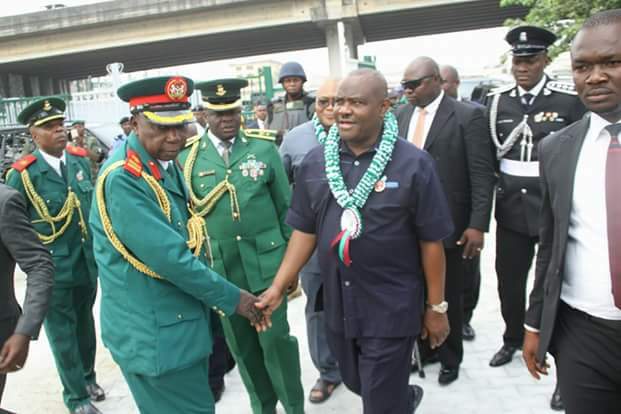 Speaking after the wreath laying to mark the 2016 Armed Forces and Remembrance Day Celebrations on Friday in Port Harcourt , Governor Wike added that his administration will continue to work with the Rivers State Nigerian Legion to provide employment and improve the wellbeing of veterans. He said the government will always ensure that the welfare of veterans and the families of those who lost their lives will receive priority attention. The governor noted that the Armed Forces Remembrance Day celebration is significant because it provides Nigerians the opportunity to publicly appreciate the contributions of armed forces personnel. He said: “As some persons have rightly observed, most often we are too inclined to take for granted the prevailing stability in our country. However, given our chequered history, the opportunities for national peace and security are made possible largely through the efforts, commitment and sacrifices of our armed forces to defend the sovereignty and Territory integrity of our country. “Let us continue to acknowledge, thank the men and women of our current armed forces who have answered the National call to service. Most significantly, let us resolve to use the lesson of self sacrifice to re-dedicate ourselves to preserving the unity of our country “. He called on Nigerians never to forget the sacrifices of the fallen heroes in order to encourage living officers to put in their best for the nation. He announced that the State Government will address the accommodation and logistics challenge of the Rivers State Nigeria Legion. “For the families of our fallen heroes who are with us today, our deep thoughts and prayers are with you for the losses you have suffered. We encourage you to take solace in the significance of the recognition and honour the nation bestows on your children, daughters, parents, brothers, sisters and other children “, he said. In his address, Rivers State Chairman, Nigerian Legion, Colonel Wilberforce Josiah commended Governor Nyesom Ezenwo Wike for his commitment to the welfare of the veterans. They appealed to him to always take action on issues that concern their welfare. Highpoint of the celebrations was the laying of wreath for the unknown soldier by Governor Wike, Deputy Governor Banigo, Speaker Adam, Acting Chief Judge, Justice Iyayi-Lamikanra and Service Commanders and Police Commissioner in Rivers State. There was also a 21 gun salute and a minute silence in honour of the fallen heroes.